Another rip-roaring adventure from Ruth Eastham, the author of the SGS book awards short-listed ‘Arrowhead’, who recently visited Steyning Grammar School and gave a great presentation to Year 7. 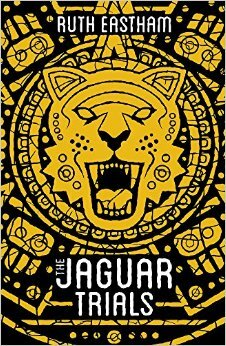 The Jaguar Trials is a fast-paced adventure set in the Amazon, following brave Ben as he sets out on an expedition with his archaeologist father to seek the fabled lost city of gold, El Dorado. After their boat is sabotaged and wrecked, Ben and his friend Raffie set out on a quest to find Ben’s father. Soon Ben discovers he bears the ‘Mark of the Jaguar’ and must survive the mysterious ‘Jaguar Trials’ before he can be reunited with his father. Along the way Ben and Raffie encounter a sinister professor, tribal shamans, the ‘unquiet spirits’ of long gone tribes wiped out by the Spanish conquistadors, and a feisty young Amazon Indian girl who helps them as they venture further into the jungle on their terrifying quest. Perfect summer-holiday reading for your 8-13 year child of either gender!